Nearly one hundred new gardening books are published in America each year, a majority of which, I’m afraid, are adequately redundant at best, and altogether unnecessary at worst. Does anyone need another book on garden feng shui, composting, or flower color combinations? The small number of new books with merit tend to be regional, focusing on plants or procedures made vague by glossy, hardbound, national releases. In this camp you will find the recently released Landscaping with Native Plants of Minnesota (Voyageur Press) by Stillwater-based garden writer Lynn Steiner. This book is the first to combine a field guide format with practical instruction about creative use of the plants and overall landscape design. 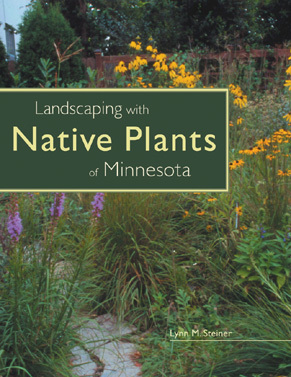 Chapters 1 through 4 cover definition and benefits of native plants, an overview of Minnesota’s natural plant life, and comprehensive design and cultural information on placing and growing native plants in your yard. The author wisely pushes no ulterior agenda. “I didn’t want the book to be limiting, to come across as useful only to people interested in landscaping entirely with natives, or to claim that this is the best way to go. These are simply interesting, useful plants—you can use two or five native perennials in your garden, you can add native shrubs to a small portion of your landscape,” says Steiner. The Gallery of Gardens section (Chapter 5) is a brilliant inclusion, featuring lovely photographs and insightful commentary on residential native gardens and landscapes from Milwaukee to St. Paul to the western suburbs. In this section, Steiner—who also contributed all 325 color photos in the book—dispels once and for all the ghastly myth that native plants are colorless and drab. The Plant Profile section, comprising the final two-thirds of the book, includes comprehensive information (plus Steiner’s stellar photos) on more than 600 native plant species, subspecies, and varieties of flowers, trees, shrubs, vines, evergreens, grasses, and ferns that have grown in Minnesota since the time before European settlement. “Beginning gardeners can use the book to learn about a whole world of wonderful plants the gardening magazines don’t often tell you about,” says Steiner, “while more advanced gardeners can look at using natives as a kind of next step, a further fine-tuning of the craft.” With this beautifully written and photographed book, Steiner, the long-time former editor of the Minnesota State Horticultural Society’s Northern Gardner magazine, transforms readers of every stripe into native plant experts.